The Delft Centre for Entrepreneur invites you to visit this entrepreneurial spark. 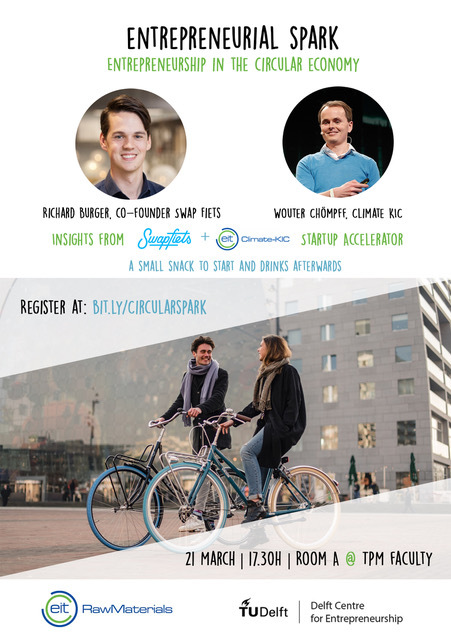 We have two speakers, Richard Burger co-founder of SWAPfiets and Wouter Chömpff, accelerator coach. Richard will share with you his experience when founding the bicycle company, how the idea came about and how it was developed into an opportunity to start and build a new large player in the bicycle market. Wouter is founder of Hamwells, a firm that develops integrated marketing & communications strategies for small and large firms. He will share his vision on how to craft strong and compelling stories. He also acts as a coach to many start-ups and will disclose insights about the start-up process. Before the spark we have some snacks and afterwards we have drinks. This entrepreneurial spark will also be live broadcasted here. To help us organize the food and drinks, please apply here.